Crazy Egg is a new tool that creates tests to figure out what people are doing on your website. Essentially this tool analyses where people are clicking and how much. Imagine that if when people click on a certain link or button on your website (or even in the middle of a blank space) they leave a physical mark making it clear that they have been there. The Crazy Egg system complies this data into a variety of formats. 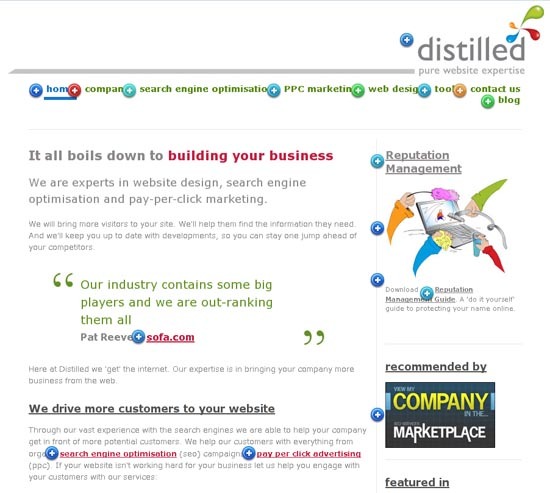 At distilled we seem to be very good at winning prizes, we won a crazy egg login by entering a lucky prize draw at the SMX West 2008 conference we attended, and have been testing the system on the distilled website since. Much like scary images of our rapidly warming planet, this thermal overview literally shows you what is hot and what is not. 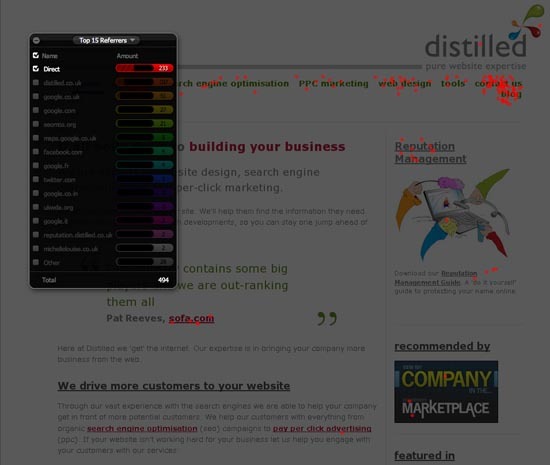 The hotter (redder) the colour the more clicks that particular area has received. If, on the other side of the colour spectrum, the area is blue then it has not been clicked very often (if at all). This is my personal favourite, mainly for the fun factor. 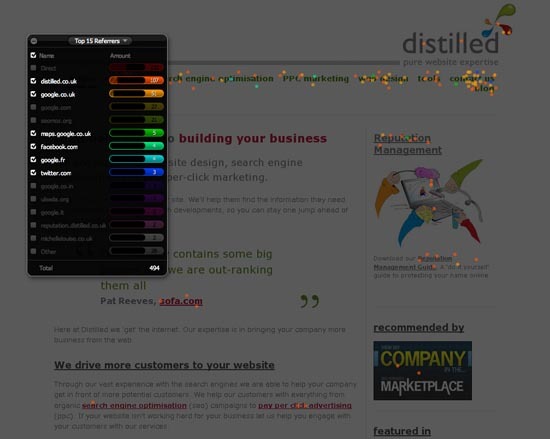 The page begins with brightly coloured luminous dots spattered all over and then they compile and shoot off into the areas that have been clicked on most. How could you resist?! This option I found quite unclear at first. Again, colours are used to highlight which areas are most popular (warmer colours being the most popular clicking hot spots). Each link has a coloured '+' sign next to it. When you click on these symbols a box pops up to make you aware of the percentage of all clicks on the entire page that have been here. A 'more' button also lets you discover what percentage of which referrers pointed traffic to this particular link. Probably the most useful way the information can be displayed; a very in-depth table detailing where the link is from, the number and percentage of clicks. The different display options cater for a whole range of customers. You can look at the data as a brief overview, to merely get a suggestion of which button is clicked on most. Or you can look in 'more' at exactly which referrer is bringing exactly what percentage of traffic to your website. Crazy Egg is also very useful from a marketing perspective. Each click is linked to the referrer, so it is very visible who exactly has been sending the most traffic to your site. This can, for obvious reasons, greatly benefit your company and point out if any of your marketing campaigns are not good value for money. 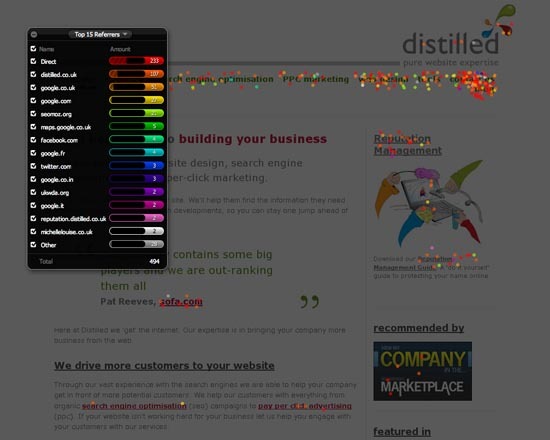 Each referrer is represented by a different colour. There is also the option to view just certain referrers by checking or un-checking a tick box selection panel. Here is the data with just one referer selected, all the red dots represent the referer the most clicks have come from. As you can see, it also possible to view a selection of referers from the entire list. Once you have purchased the Crazy Egg tool you can apply it to a certain number of pages, depending on the package you purchase. 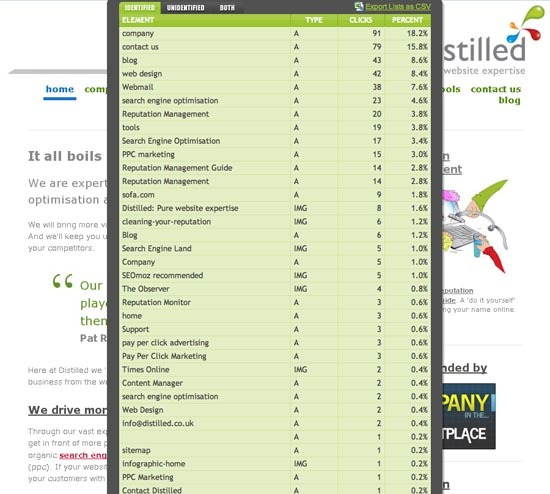 You can also monitor your pages' progress as often as you want. Bear in mind it may take some time to gather enough data for it to be considerable enough to analyse, depending on the size of your company and the quantity of traffic that visits your site. Brilliant eh? Soon we will have enough data to be able to test various elements on the Distilled site and will faithfully report our findings in future blog posts.